El monitoreo continuo de glucosa (MCG) es una herramienta que permite evaluar el control glucémico, la variabilidad glucémica y la detección de episodios de hipoglucemia asintomática y nocturna. Actualmente disponemos de dispositivos de última generación que son más precisos y sensibles para la detección de hipoglucemia, lo cual ha permitido el desarrollo de algoritmos predictores con el fin de prevenir dichos eventos, ya sea utilizando alarmas para que el paciente intervenga o suspendiendo la infusión de insulina. Esta tecnología se encuentra disponible en Colombia y ha demostrado ser una alternativa segura y efectiva en el tratamiento de pacientes diabéticos con alto riesgo de hipoglucemia severa y otras poblaciones especiales como niños y mujeres embarazadas. El objetivo de esta revisión es resumir la evidencia clínica relevante, ventajas y desventajas de esta terapia, así como el impacto clínico del uso del MCG en tiempo real (MCG-TR) en pacientes en tratamiento con múltiples dosis o sistemas de infusión subcutánea de insulina. Pontificia Universidad Javeriana, Facultad de Medicina, Bogotá, Colombia. 2. Nathan DM, Genuth S, Lachin J, Cleary P, Crofford O, Davis M, et al. The effect of intensive treatment of diabetes on the development and progression of long-term complications in insulin-dependent diabetes mellitus. N Engl J Med. 1993 Sep;329(14):977-86. 3. Danne T, Nimri R, Battelino T, Bergenstal RM, Close KL, DeVries JH, et al. International consensus on use of continuous glucose monitoring. Diabetes Care. 2017;40(12):1631-40. 4. Hoeks LBEA, Greven WL, de Valk HW. Real-time continuous glucose monitoring system for treatment of diabetes: A systematic review. Diabet Med. 2011;28(4):386-94. 5. Claus Vogelmeier, M.D., Bettina Hederer, M.D., Thomas Glaab, M.D., Hendrik Schmidt PD, Maureen P.M.H. Rutten-van Mölken, Ph.D., Kai M. Beeh, M.D., Klaus F. Rabe, M.D., and Leonardo M. Fabbri MD, Investigators for the P-C. New England Journal. Clin Trials. 2010;363:411-22. 6. Pickup JC, Freeman SC, Sutton AJ. Glycaemic control in type 1 diabetes during real time continuous glucose monitoring compared with self monitoring of blood glucose: Meta-analysis of randomised controlled trials using individual patient data. Bmj. 2011;343(7815). 7. Gómez Medina AM, Marín Sánchez A. Monitorización continua de glucosa en tiempo real: Imprescindible su uso combinado con infusión continua de insulina. Av en Diabetol. 2011;27(4):143-50. 8. Bruttomesso D. Technological Advances in the Treatment of Type 1 Diabetes. 2014. 81-98 p.
10. Keenan DB, Mastrototaro JJ, Voskanyan G, Steil GM. Delays in minimally invasive continuous glucose monitoring devices: A review of current technology. J Diabetes Sci Technol. 2009;3(5):1207-14. 11. Kubiak T, Hermanns N, Schreckling HJ, Kulzer B, Haak T. Assessment of hypoglycaemia awareness using continuous glucose monitoring. Diabet Med. 2004;21(5):487-90. 12. Gómez AM, Carrillo DCH, Velandia OMM. Devices for continuous monitoring of glucose: Update in technology. Med Devices Evid Res. 2017;10:215-24. 13. Gómez AM, Marín Sánchez A, Muñoz OM, Colón Peña CA. Precisión numérica y clínica de la monitorización continua de glucosa en pacientes colombianos en terapia con bomba de infusión de insulina con suspensión automática en hipoglucemia. Endocrinol y Nutr. 2015;62(10):485-92. 14. Pfützner A, Klonoff DC, Pardo S, Parkes JL. Technical aspects of the Parkes error grid. J Diabetes Sci Technol. 2013;7(5):1275-81. 16. Aberer F, Hajnsek M, Rumpler M, Zenz S, Baumann PM, Elsayed H, et al. Evaluation of subcutaneous glucose monitoring systems under routine environmental conditions in patients with type 1 diabetes. Diabetes, Obes Metab. 2017;19(7):1051-5. 18. Vaddiraju S, Burgess DJ, Tomazos I, Jain FC, Papadimitrakopoulos F. Technologies for continuous glucose monitoring: Current problems and future promises. J Diabetes Sci Technol. 2010;4(6):1540-62. 20. Haak T, Hanaire H, Ajjan R, Hermanns N, Riveline JP, Rayman G. Flash Glucose-Sensing Technology as a Replacement for Blood Glucose Monitoring for the Management of Insulin-Treated Type 2 Diabetes: a Multicenter, Open-Label Randomized Controlled Trial. Diabetes Ther. 2017;8(1):55-73. 23. Ruedy KJ, Parkin CG, Riddlesworth TD, Graham C. Continuous Glucose Monitoring in Older Adults With Type 1 and Type 2 Diabetes Using Multiple Daily Injections of Insulin: Results From the DIAMOND Trial. J Diabetes Sci Technol. 2017;11(6):1138-46. 25. Conceição J, Dores J, Araújo F, Laires PA, Carr RD, Brodovicz K, et al. Severe hypoglycaemia among patients with type 2 diabetes requiring emergency hospital admission: The Hypoglycaemia In Portugal Observational Study- Emergency Room (HIPOS-ER). Diabetes, Obes Metab. 2018;20(1):50-9. 26. Hung YC, Lin CC, Chen HJ, Chang MP, Huang KC, Chen YH, et al. Severe hypoglycemia and hip fracture in patients with type 2 diabetes: a nationwide population-based cohort study. Osteoporos Int. 2017;28(7):2053-60. 28. Lee AK, Warren B, Lee CJ, Mcevoy JW, Matsushita K, Huang ES, et al. The Association of Severe Hypoglycemia With Incident Cardiovascular Events and Mortality in Adults With Type 2 Diabetes. 2017;(7):1-8. 29. Pieber TR, Marso SP, McGuire DK, Zinman B, Poulter NR, Emerson SS, et al. DEVOTE 3: temporal relationships between severe hypoglycaemia, cardiovascular outcomes and mortality. Diabetologia. 2018;61(1):58-65. 30. Bolinder J, Antuna R, Geelhoed-Duijvestijn P, Kröger J, Weitgasser R. Novel glucose-sensing technology and hypoglycaemia in type 1 diabetes: a multicentre, non-masked, randomised controlled trial. Lancet. 2016;388(10057):2254-63. 35. van Beers CAJ, DeVries JH, Kleijer SJ, Smits MM, Geelhoed-Duijvestijn PH, Kramer MHH, et al. Continuous glucose monitoring for patients with type 1 diabetes and impaired awareness of hypoglycaemia (IN CONTROL): a randomised, open-label, crossover trial. Lancet Diabetes Endocrinol. 2016;4(11):893-902. 38. Kramer CK, Choi H, Zinman B, Retnakaran R. Glycemic variability in patients with early type 2 diabetes: The impact of improvement in ? ?-cell function. Diabetes Care. 2014;37(4):1116-23. 39. Kilpatrick ES, Rigby AS, Goode K, Atkin SL. Relating mean blood glucose and glucose variability to the risk of multiple episodes of hypoglycaemia in type 1 diabetes. Diabetologia. 2007;50(12):2553-61. 40. Johnson SL, McEwen LN, Newton CA, Martin CL, Raskin P, Halter JB, et al. The impact of continuous subcutaneous insulin infusion and multiple daily injections of insulin on glucose variability in older adults with type 2 diabetes. J Diabetes Complications. 2011;25(4):211-5. 43. Kovatchev B, Cobelli C. Glucose variability: Timing, risk analysis, and relationship to hypoglycemia in diabetes. Diabetes Care. 2016;39(4):502-10. 46. Lane, W., Weinrib, J., Hale C. The effect of addition of liraglutide to high-dose intensive insulin therapy: a randomized prospective trial. Diabetes, Obes Andm. 2014;6-11. 48. Tumminia A, Crimi S, Sciacca L, Buscema M, Frittitta L, Squatrito S, et al. Efficacy of real-time continuous glucose monitoring on glycaemic control and glucose variability in type 1 diabetic patients treated with either insulin pumps or multiple insulin injection therapy: A randomized controlled crossover trial. Diabetes Metab Res Rev. 2015;31(1):61-8. 49. Secher A, Ringholm L, Andersen H, Damm P, Mathiesen E. The Effect of Real- Time Continuous Glucose Monitoring in Pregnant Women With Diabetes. Diabetes Care. 2013;36:1877. 50. Feig DS, Donovan LE, Corcoy R, Murphy KE, Amiel SA, Hunt KF, et al. Continuous glucose monitoring in pregnant women with type 1 diabetes (CON- CEPTT): a multicentre international randomised controlled trial. Lancet. 2017;390(10110):2347-59. 53. Restrepo-Moreno M, Ramirez-Rincon A, Hincapie-Garcia J, Palacio A, Mon- salve-Arango C, Aristizabal-Henao N, et al. 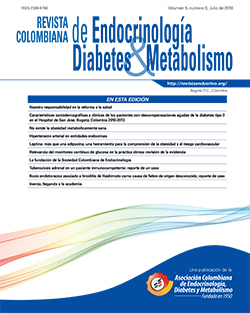 Maternal and perinatal outcomes in pregnant women with type 1 diabetes treated with continuous subcutaneous insulin infusion and real time continuous glucose monitoring in two specialized centers in Medellin, Colombia. J Matern Fetal Neonatal Med. 2018 Mar;31(6):696-700. 55. Roze S, Saunders R, Brandt AS, de Portu S, Papo NL, Jendle J. Health-economic analysis of real-time continuous glucose monitoring in people with Type 1 diabetes. Diabet Med. 2015;32(5):618-26. 56. Deiss D, Bolinder J, Riveline JP, Battelino T, Bosi E, Tubiana-Rufi N, et al. Improved glycemic control in poorly controlled patients with type 1 diabetes using real-time continuous glucose monitoring. Diabetes Care. 2006;29(12):2730-2. 58. O’Connell MA, Donath S, O’Neal DN, Colman PG, Ambler GR, Jones TW, et al. Glycaemic impact of patient-led use of sensor-guided pump therapy in type 1 diabetes: A randomised controlled trial. Diabetologia. 2009;52(7):1250-7. 59. Denis R, Véronique S, Yves R, Bruno G, Eric R, Hélène H, et al. 11-Incre- mental Value of Continuous Glucose Monitoring When Starting Pump Therapy in Patients With Poorly Controlled Type 1 Diabetes. Diabetes Care. 2009;32(12):2245-2250. 62. Lind M, Polonsky W, Hirsch IB, Heise T, Bolinder J, Dahlqvist S, et al. Continuous glucose monitoring vs conventional therapy for glycemic control in adults with type 1 diabetes treated with multiple daily insulin injections the gold randomized clinical trial. JAMA - J Am Med Assoc. 2017;317(4):379-87.